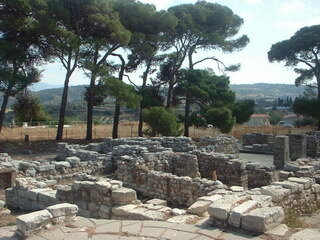 The village of Tylissos stands at the road leading from Iraklion into the Ida Mountains, 15 km away from Iraklion. It is situated on a plateau on the northeast slopes of the Ida Mountains and has a beautiful village square with cafe and a Turkish well. Tylissos is well known for the excavation site of three villas from the late Minoan period, which are located in the middle of the village. A beautiful spot under mighty pine trees with a view into the vineyards. The numerous finds, three bronze bathtubs amongst other things, can be seen in the Archaeological Museum in Iraklion.